In premodern Japanese society, the “Danka”(* 1) and “Ujigami”(* 2) systems were well organized and functional, and the temples and shrines in those days played an important role in the social structure all over Japan. Along with the era of high-speed economic growth in Japan, however, the rituals in temples and shrines have become strictly formal, so many Japanese, especially young people, pay visits to temples and shrines only on special occasions like New Year’s Day, funerals and when praying for success in university entrance examinations. Today, however, there are signs of change in temples and shrines in big cities like Tokyo. They sometimes put on public attractions like jazz concerts, piano recitals, ethnic dancing and fashion shows. Also some young business people go to a temple to feel relaxed, so a “temple café” has opened up. One young Buddhist monk has released a lot of information on “simple Buddhist discipline” and “daily life as a Buddhist monk” through the Internet, and, at the same time, his Buddhist preaching is going well with live performances to a young audience. Using such new trends, temples and shrines are getting closer to young people who are searching for something new. In this press tour, you will cover two temples and one shrine which have made efforts to start new activities. 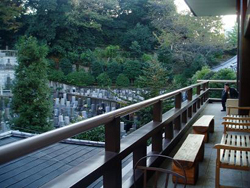 In Komyoji temple, located in Kamiyacho (Minato-ku), you will visit a “café” on the 2nd floor of the main building which attracts neighboring business people especially at lunch time on sunny days. 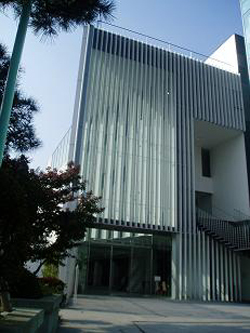 At Baisoin temple in Aoyama, you can see the new main building with modern appearance designed by famous architect Kengo Kuma. You will also visit the exhibition of “The works and the world of Emi Wada – Kyoto and beyond 1985 to 2005 –” in the basement hall (Soshido) of the Baisoin main building, and you can see the mixture of "spiritual atmosphere" and "modern art" there. 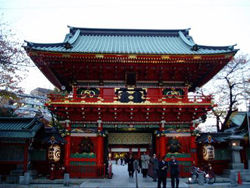 Finally you will visit the famous Kanda Myojin shrine in the Kanda district. The shrine has released new trial of "mixture of IT and shrine" by corroborating with Akihabara "electric town" which, in an unlikely mixture of ancient and ultra-modern, is the Ujiko (Uji) of Kanda Myojin. Please note that if a funeral is being held the tour may be modified. (* 1) A danka is a family that selects a particular Buddhist temple to conduct all its funerals, memorials, and other services in exchange for which it offers fees and donations toward the upkeep of the temple. (* 2) Originally the tutelary deity of an uji or clan. Early Japanese society was composed of many uji, the members of which believed themselves to be descended from a common ancestor who looked after their interests. This deified ancestor, ujigami, was worshiped at a shrine under the exclusive control of the uji. Occasionally the ujigami was not the direct ancestor of an uji, but rather a deity closely connected with it. Keisuke Matsumoto, 26, serves at Komyoji temple (Jodo Shinshu, Honganji sect). After graduating from the Faculty of Philosophy of Tokyo Univ., he was attracted to Buddhism and entered the Komyoji temple. He became a Buddhist monk after passing an examination in 2003. Along with his opinion that "Buddhist teaching is the deepest and widest of all", he started a website "Higan-ji"(* 3), and there he regularly introduces his opinions and daily life as a Buddhist monk to the public. His way of "Buddhist preaching" has been well accepted by young Japanese of his generation. He will brief you on "why he decided to be a Buddhist monk", "his aim as a Buddhist monk", and "future of Buddhist temples" . (* 3) Higan ("far shore") is the eternal paradise awaiting those who achieve enlightenment as opposed to "this shore" (shigan). 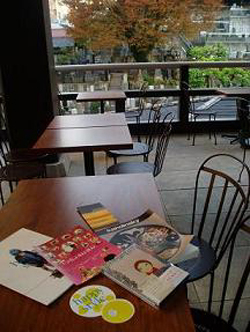 "Kamiyacho Open Terrace" café (see photo 1 and 2), located on the 2nd floor of Komyoji main building, originates from Keisuke Matsumoto's idea -"Komyoji should be more open to the public". Inspired by this idea, volunteers gathered sofas, tables, ashtrays, wireless LAN, and books for free bollowing. Now "Kamiyacho Open Terrace" attracts lots of business people who are working in the neighboring companies, especially at lunch time on weekdays. From the Terrace, people enjoy the view of Tokyo Tower along the greenery and the well-kept cemetery, so it is, people say, a city oasis. This Terrace opens daily from April to October, and during this period, people can order soft drinks and Japanese sweets there. Moreover, young music-lovers occasionally hold "Higan music event -TASOGARE-" at the Terrace, and This is also getting to be well-known. On this tour, Takeshi Kihara, the manager, and Kakuhou Aoe, the cook, will welcome you with Japanese sweets and a lunch box. Baisoin temple was founded in 1643 as a family temple of the Aoyama clan whose home was in present-day Aoyama, so it can be said that the dawn of Aoyama area dates from the foundation of Baisoin temple. Baisoin temple is the 24th point on the Great 33 Kannon pilgrimage in Tokyo, so a number of people pay a visit there, and the "gujo-odori" dance festival which is held in every June attracts local residents as a good old event. On the other hand, the new Baisoin main building (see photo 3) dates from 2003, designed by the world-famous Japanese architect Kengo Kuma. The building features plenty of glass and has a cool and beautiful image. Only one minute from Gaien-mae station of the Tokyo Metro Ginza line, "Soshido Hall", in the basement of the main building, was designed as a public space with an independent entrance, musical equipment and a big stage. Now "Soshido Hall" occasionally stages non-commercial events for the public. This tour covers both the inside and outside of main building. You will find barrier-free structures and a mixture of modernity and Japanese tradition in the appearance. You will also have a short briefing by Shinjo Nakajima, resident priest, concerning the new main building and the future prospect of Baisoin temple. Emi Wada, a world-renowned costume designer, won an Academy Award for "Ran" (directed by Akira Kurosawa 1985). 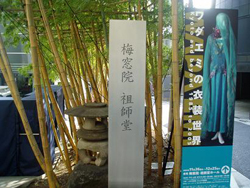 She is now presenting an exhibition showing her unusual ability and distinguished history at the Soshido Hall in Baisoin temple to mark the 20th anniversary of winning the Academy Award. The exhibition shows you about 100 selected costumes including the life-size doll's costume used in "Yume" (directed by Akira Kurosawa 1990), and the exhibition is also designed by Emi Wada herself. The artistic quality blends well with the tranquility of Soshido Hall (see photo 4). You will have a briefing from Ms. Machida, the producer, about this exhibition. 3. Kanda Myojin : the new tie-up with "Akihabara Electricity Town"
Kanda Myojin (see photo 5) is renowned for over 1000-years history. Originally a shrine of the samurai class, it was highly regarded by the shogun Tokugawa Ieyasu, and eventually became popular with the general public. Even now not only the people of the 108 communities from the upscale Marunouchi business district to the plebeian Kanda-Nihonbashi district but also many large companies worship Kanda Myojin in the traditional Ujigami-Ujiko system. 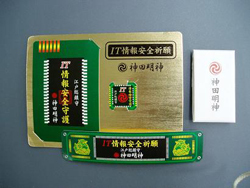 Kanda Myojin is also developing a new approach to popularization. They often optimize traditional annual events by updating them, and they have a huge following. You will have a briefing from Mr. Shimizu, press officer, about the appeal of "people-friendly" Kanda Myojin, which stands for both "tradition" and "innovation". * FPC will later inform the participants of methods for payment, cancellation fee etc.